3. Bichromatic measurement, Multi-calculation methods include ABS, Cut-off , Linearity and Log. The CA15-3 for the quantitative determination of the Cancer Antigen CA15-3 concentration in human serum. This kit is intended for research use only. Breast cancer is the most common life-threatening malignant lesion in women of many developed countries today, with approximately 180,000 new cases diagnosed every year. Roughly half of these newly diagnosed patients are node-negative, however 30% of these cases progress to metastatic disease. cancer. CA15-3 levels are also increased in colon, lung and hepatic tumors. The CA15-3 ELISA test is based on the principle of a solid phase enzyme-linked immunosorbent assay. The assay system utilizes a monoclonal antibody directed against a distinct antigenic determinant on the intact CA15-3 molecule is used for solid phase immobilization (on the microtiter wells). A rabbit anti-CA15-3 antibody conjugated to horseradish peroxidase (HRPO) is in the antibody-enzyme conjugate solution. The test sample is allowed to react sequentially with the two antibodies, resulting in the CA15-3 molecules being sandwiched between the solid phase and enzyme-linked antibodies. After two separate 1-hour incubation steps at 37C, the wells are washed with water to remove unbound labeled antibodies. A solution of TMB Reagent is added and incubated for 20 minutes, resulting in the development of a blue color. The color development is stopped with the addition of Stop Solution changing the color to yellow. The concentration of CA15-3 is directly proportional to the color intensity of the test sample. Absorbance is measured spectrophotometrically at 450 nm. 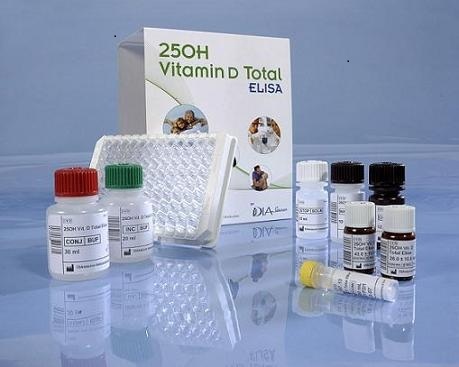 The Gentaur 25OH Vitamin D Total ELISA is a solid phase Enzyme Linked Immunosorbent Assay performed on microtiterplates. During a first 2 hours incubation step, at room temperature, total 25OH Vitamin D (D2 and D3) present in calibrators, controls and samples is dissociated from binding serum proteins to fix on binding sites of a specific monoclonal antibody. After 1 washing step, a fixed amount of 25OH Vitamin D-labelled with biotin in presence of horseradish peroxidise (HRP), compete with unlabelled 25OH Vitamin D2 and 25OH Vitamin D3 present on the binding sites of the specific monoclonal antibody. After a 30 minutes incubation at room temperature, the microtiterplate is washed to stop the competition reaction. The Chromogenic solution (TMB) is added and incubated for 15 minutes. The reaction is stopped with the addition of Stop Solution and the microtiterplate is then read at the appropriate wavelength. The amount of substrate turnover is determined colourimetrically by measuring the absorbance, which is inversely proportional to the total 25OH Vitamin D (D2 and D3) concentration. A calibration curve is plotted and the total 25OH Vitamin D (D2 and D3) concentrations of the samples are determined by dose interpolation from the calibration curve. The Cysticercosis Antigen (Ag) ELISA (Ref. 650501) is a sandwich Enzyme-Linked ImmunoSorbent Assay based on monoclonal antibodies for the qualitative determination of viable metacestodes (cysticerci) of Taenia spp. in human and porcine serum samples. Taenia solium cysticercosis is an infection of humans and pigs with metacestode larvae (cysticercus) of Taenia solium. Circulating antigen detection in serum is an important diagnostic method that indicates the presence of viable parasites. The monoclonal antibodies used in this assay are produced against excretory secretory products (ESP) of viable T. saginata cysticerci. The glycoprotein antigens detected by these monoclonal antibodies are present on the tegument and in the excretory secretory products of metacestodes. The assay demonstrates the presence of viable cysticerci only, it does not detect degenerated or calcified cysticerci. In this respect, unlike antibody detection, measurement of circulating antigen levels allows differentiation of cysticercosis cases with viable parasites, with antigen levels correlating to the numbers and size of lesions. It can as such also provide a tool for serological monitoring of antiparasitic therapy in human or pigs: antigen levels drop rapidly after successful anthelminthic treatment. The assay is genus specific, not species specific. The assay does not allow the differentiation between infections of different Taenia species in pigs. In experimentally infected pigs, circulating antigens were first detected between 2 and 6 weeks post infection and remained present generally throughout an observation period of 6 months, even in pigs carrying only five to eight living cysts. The minimum number of living cysts, that could be detected using the Cysticercosis Ag ELISA, was one. Because T. solium is the only Taenia sp. causing cysticercosis in man, the test is specific. No cross-reactions were observed with sera from patients with other parasitologically and/or serologically confirmed infections. The sensitivity of the assay decreases when the number of viable cysts is low; infections with one viable cyst are often not detectable. Antigen levels are generally higher in extraparenchymal neurocysticercosis (NCC) (particularly subarachnoid NCC) than in intraparenchymal NCC; therefore, high antigen levels should lead one to suspect the presence of extraparenchymal NCC.